How can I use MME? How can I use effects for MMD? 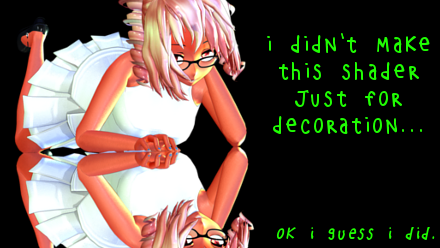 Can I hide MMD models from my mirror? Can I keep MMD models from casting shadows? How to edit effects for MMD? How to write new effects for MMD? Maybe you’ve had some time to play with MME effects for MMD. There are a lot of great effects than can breathe dramatic new life into your renders. But, as with everything else, there’s a lot under the hood. Understanding some of that can help you render the exact scene you want, and it’s a great way to learn more about shaders if you’re interested in modifying them or writing them from scratch. Open up MMD and click on the MME button in the upper right corner of your screen. Select Effect Mapping. Hopefully, you’ve done this a million times, but in case you haven’t…. A window titled Map Effect File pops up. From here, you should see all of your loaded models. You can set effects for any of them by right clicking on a row and selecting Set Effect (and then, of course, navigating to and selecting the effect you want in the following dialog). Or, you can hide a model by clicking a row’s checkbox. By right clicking on a row and selecting Subset-Extract, you can break a model up into its component materials, allowing you to set a different effect for each material, or to hide individual elements. Notice how all of these options are listed in a tab titled Main? That’s important. What MME is saying is that it’s going to render these models, using the shaders specified, to the main render target. Which is to say, to your screen. If you haven’t loaded any other effects, there won’t be any other tabs, so OK out of the screen to apply your changes, then try loading an accessory-based effect. I’m going to load WorkingFloor2.008. Now, open up your effect mapping panel again. Look at the top. Do you see that there’s a new tab titled WorkingFloorRT? RT is for render target, and this new tab is a new, off-screen image to which MME is going to render, using different shaders and different models. When it comes time to render to the main screen, MME is going to use the new shader loaded onto WorkingFloor.x to draw that model (which is just a plane that you can open up in PMXE if you want). WorkingFloor.fx looks at an off-screen render target to decide what to draw. Unsurprisingly, it looks at WorkingFloorRT to figure out what to draw. Working Floor is just an example. Most accessory-based effects load new render targets. Hide a model from AL_EmitterRT and AutoLuminous will no longer know that model exists, and so it will stop glowing. 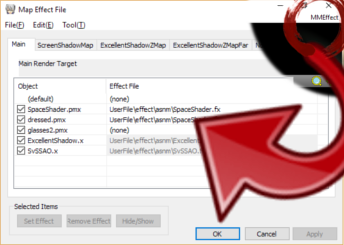 Or hide a material from all of the render targets that Excellent Shadow creates and your light won’t know that your material exists– it will no longer cast a shadow. If you’re having problems hiding something, double check which render target you’re hiding a model from! Each of these render targets exists for a reason, and each of them does something slightly different from the last. Mostly, there’s a reason that effects use specific shaders (like WF_Object.fxsub) for their off-screen render targets. These shaders are modified from the defaults, because otherwise, why even bother with a new render? For example, WF_Object.fxsub renders objects from a different perspective. So, mostly, you won’t want to change these. 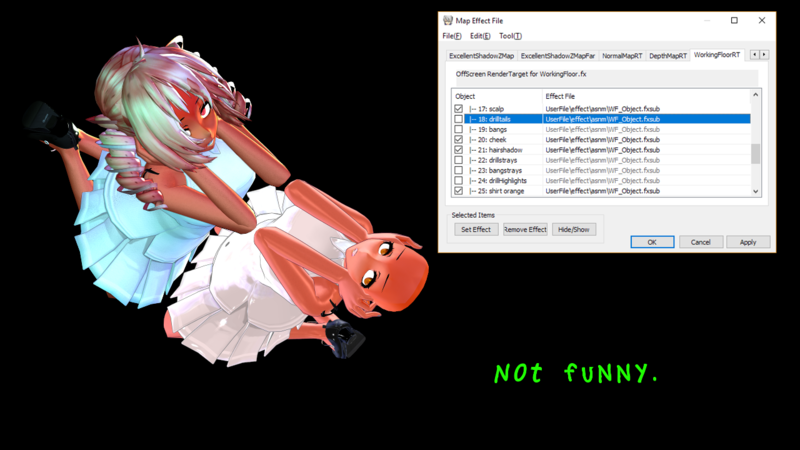 If you do, notice that the load dialog only shows you files of type .fx unless you tell it otherwise, and many of these effects have a different extension, like .fxsub. But there are times when you may want to make changes. One of the problems with effects like WorkingFloor is that they don’t use the shader you’ve used on your main render target– your screen. But sometimes, there are alternatives to the default shaders. For instance, if you use Adult Shader, I’ve created an alternative Working Floor object using the Adult Shader pixel shader, and if you want, you can download that, and apply WF_ObjectAdultShader.fx to an object in your WorkingFloorRT. It replaces the existing WF_Object. There are other effects that work like this as well. 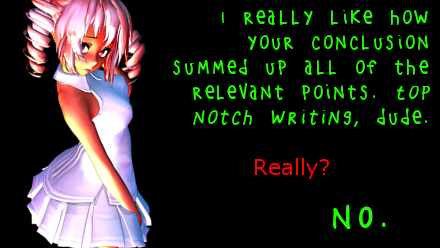 Some effects, like HgSAO, bundled into NCHL, actually include a few optional .fxsub files. This is getting into code now, and most users aren’t going to be interested in it. But modifying effects for MMD is a great way to spruce up your renders and it’s a great way to learn some programming, a skill that is useful in an increasing number of fields. That might look like gibberish, but we can go through it. Learning how to create High Level Shader Language (HLSL) effects is like learning a new language. You read it even though it doesn’t make sense, then you read it again and again, and eventually, it starts making sense, first one line, then a week later, the next one. You can do it without a teacher, but teachers sure help. #define is a preprocessor directive. Essentially, this line is saying that any time the shader reads the word OFFSCREEN_FX_OBJECT, it should substitute the words “WF_Object.fxsub”. You’ll see this technique many, many times in reading effects. That shouldn’t be so mysterious anymore. MME is saying, look at all of the models, and if any of them are named anything (* is a wild card), with an extension of .pmx, it should apply WF_Object.fxsub to that model to render to the new render target. And WF_Object.fxsub isn’t much different than, say, AdultShader.fx— it’s just drawing to a different “screen”, one that will go through another stage of processing before it makes it to the visible screen. There’s one more thing, which is that WorkingFloor.fx needs to know how to read this new render target. So it sets up a sampler to tell your video card how to read it– to average the colors between pixels when it looks up UV values, to not bother interpolating between mipmaps, and to use the edge of the texture when it looks up a UV value greater than one or less than zero. And that, in a nutshell, is everything you need to know about render targets! Keep the Faith and credit your sources! 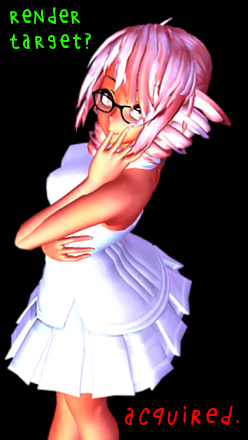 I used my own Tda Tutor Teto for this tutorial, dolled up in a dress based on meshes by Kanahiko-chan! I just started and I need to ask a really dumb question (cus I gotta start somewhere)… How do I load an fx. file into MMD? Also, I noticed there are some shaders only compatible with either 32 bit or 64 bit; how do I find out if a certain shader is compatible to my version of MMD? There are two basic types of effects (it’s more complicated than that, but let’s start with something simple): those that come with an .x accessory of the same first name, and those without. Former ones are loaded in the Accessory Manipulation Panel, and they usually affect the whole view (SSAO would be a typical example of that). Latter ones apply directly to a particular model in the MME’s Effect Mapping panel (like AdultShader). 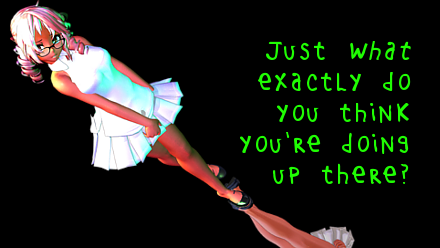 I think, if I understand your issue, you want to load a .fx that doesn’t have a .x with it. You click on that MME in the upper right of your screen, then click on Effect Mapping, highlight the model upon which you want to apply the effect, click the Set Effect button, and navigate to your .fx file… yes? You have to download MME separately.